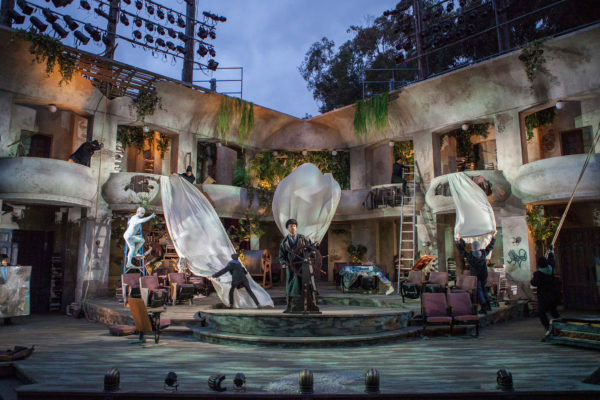 Magic, mischief, mayhem and (promised) marriage are just some of the elements of Shakespeare’s “The Tempest,” playing through July 22 at The Old Globe’s outdoor Festival Theatre. The script offers lots of leeway for stage business, opening with a storm at sea and a shipwreck and continuing with three subplots, a magician and several sprites of different appearance running around. Director Joe Dowling and his tech staff take good advantage of this. 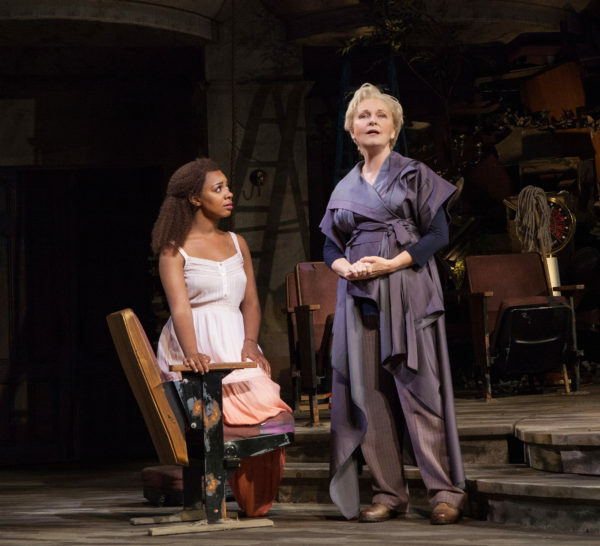 This “Tempest” also offers a gender switch in eminent stage actress Kate Burton as the magician Prospera. Burton is a wonder to watch, with her fine delivery and command of the text. She is also an engaging presence in a part that is often played with an off-putting, angry attitude. Since “The Tempest” is largely about theater, set designer Alexander Dodge has put a theater in the center of his dual-level stage, complete with seats and a revolving slanted stage. But because several other sites — such as Prospera’s cell, an island and a shipwreck — are called for, he smartly leaves a good deal to the audience’s imagination. Prospera, the dethroned Duke of Milan, has spent the last 12 years stranded on an isolated island with her young daughter Miranda, after being deposed and left there to die by her ambitious brother Antonio and his friend Alonso, King of Naples. Fortunately, the elderly lord Gonzala made sure Prospera had provisions, including her prized books. She’s been studying magic and has become quite proficient at it. Gonzala is another role written for a man. Here it’s played very well and with exceptional compassion by Lizan Mitchell. The second subplot involves Prospero’s brother Antonio and Alonso’s brother Sebastian, who conspire to kill Alonso and Gonzalo so that Sebastian can become King of Naples. This requires more magic, this time by Ariel. The third subplot is the romance between Miranda and Alonso’s son Ferdinand, whose dad thought he’d died in the storm. When Prospera engineers and observes their first meeting, she’s convinced the two are meant for each other. Dowling has assembled a sterling cast, with nary a weak link. Sam Avishay and Nora Carroll are adorable as the young lovers Ferdinand and Miranda. It’s not a Shakespeare play without fools; “The Tempest” gives us drunken butler Stephano (Robert Dorfman) and jester Trinculo (Andrew Weems). A more amusing pair would be difficult to find. René Thornton Jr. and Daniel Ian Joeck are truly despicable as the villains Antonio and Sebastian. Alonso (Robert Foxworth), who was also in on the plot to unseat Prospera, at least has the decency to repent late in the play. Manoel Felciano is excellent as the saddest character, Prospera’s deformed servant Caliban. Philippe Bowgen, who made his Globe debut last year as Picasso in “Picasso at the Lapin Agile,” makes a terrific — and amazingly agile — Ariel. After all the negativity of usurpation, storms and murder plots, the ending of “The Tempest” is a bit of a surprise: After working the necessary magic, Prospera assembles all the parties — even the plotters — and forgives everyone for everything. “The rarer action is in virtue than in vengeance,” she says. Wouldn’t it be nice if we mere mortals took a leaf from her playbook?